Best-selling author Martha Grimes was the guest of honor at a special program presented by the Mayor and Town Council of Mountain Lake Park Saturday afternoon. In front of a standing-room-only crowd in the town hall, Grimes spoke about the characters and locations in her four-book series that center on the town, and more specifically on the Mountain Lake Park Hotel during its heyday years of operation. The main character in those books is 12-year-old Emma Brown, whose mother was a co-owner of the hotel, as was the case with Grimes’ mother in real life. “Emma is indeed autobiographical; however, she represents not the person I was, but the person I would have liked to have been at that age,” Grimes said. Grimes is best known internationally for her 22-novel Richard Jury mystery series, one book of which garnered her the coveted Nero Wolfe Award for Best Mystery of the Year. The Mayor and Town Council presented to her an original painting of the Mountain Lake Park Hotel, partially visible in the photo above, and also unveiled a permanent historical plaque featuring her and her books that will be placed on an exhibit stand in front of the town hall facing the former MLP Hotel property. Holding the plaque in the photo above are town council member Don Sincell and Mayor Leo Martin (far right). Also in the photo with Ms. Grimes is Kathryn Sincell-Corwell, far left, who coordinated the Martha Grimes Day event and also arranged for the painting of the hotel. Following the program, Grimes signed copies of her books for scores of interested readers. A resident of the Washington, D.C., area, Grimes was accompanied by her son Kent, daughter-in-law Travis, and two grandsons. Photo by John McEwen. Renowned author Martha Grimes will be honored on June 18 at the Mountain Lake Park Town Hall from 2 to 4 p.m., as the town celebrates her literary accomplishments. Grimes has penned more than 30 books, four of which are based on her life and experiences growing up in Mtn. Lake Park. Her mother, June Grimes, owned and operated the famed Mtn. Lake Hotel, where Martha spent much of her childhood. The public is invited to attend the event, and the author has offered to autograph books for those who wish. The writer lives near Bethesda, and does visit Garrett County from time to time, although she no longer has family members in the area. Her son, Kent, a public relations executive, resides in Washington, D.C., as do her two grandsons. In addition to her writing career, she has made many strides in the area of animal protection, and has in the past donated up to 2/3 of her royalties to animal rescue and protection organizations. World renowned author Martha Grimes, who spent many of her younger years in Mountain Lake Park, will be the guest of honor at a special program and book signing on Saturday, June 18, 2 to 4 p.m. at Mountain Lake Park Town Hall. Grimes, who is perhaps best known as the author of the Richard Jury mystery series (22 books to date), also authored a four-book series based on her early years spent at the Mountain Lake Park Hotel, which was owned and operated by her mother. The lead character in her four books that are set in the Park and the Oakland area is 12-year-old Emma Graham, who actually represents Martha herself at that age. “Hotel Paradise [the title of the first book], is the story of my 12-year-old life,” said Grimes, who is a native of Pittsburgh, but spent her summers at the hotel. The three subsequent books in the mystery series are titled Cold Flat Junction, Belle Ruin, and her most recent release, Fadeaway Girl, which includes Emma’s employment as a cub reporter for the local newspaper The Conservative, representing The Republican. Ordinance No. 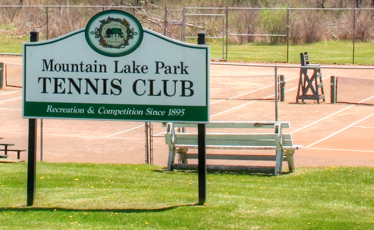 2011-01, titled Mountain Lake Park’s Community Protection from Natural Gas Extraction Ordinance, was introduced to the council by Mayor Leo Martin. The first reading of the measure was held Jan. 6, followed by a public hearing on Feb. 3, and the ordinance was adopted at last Thursday’s regular March meeting.